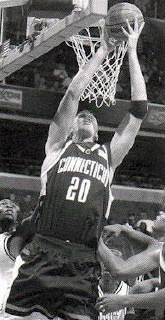 Justin Brown was a Center for the UConn Huskies from 1998 – 2003. He was a player on the first UConn National Collegiate Athletic Association Championship Team in 1999. I had the opportunity to talk to Justin in December, 2004, by phone from Germany where he is playing basketball, about his basketball experiences, his time at UConn, and his current career path. Justin grew up in Australia where the climate is much warmer and indoor sports like basketball were not as popular as outdoor sports like track and field. As a youngster, around age 8, Justin began playing “little athletics” (track and field). He was very successful, setting state records in running, jumping and throwing events. Justin’s mother was the time keeper for the events, and with these outdoor sports she contracted a level four melanoma skin cancer in her leg. It was life threatening, and although she was very fortunate to recover, she suggested Justin pick an indoor sport. That’s when basketball came into Justin’s life. Getting off to a slow start at age 15, Justin fell in love with the game quickly. “A lot of coaches saw potential in me. I was athletic for my size, and things went well from there so I just continued to develop.” He received national recognition while playing in state tournaments, and was offered a scholarship to attend the Australia Institute of Sports Basketball Program. Justin had only been playing basketball for one year when offered the scholarship. He discussed it with his parents, and was soon enrolled at the sports institute. Justin had a lot of developing to do, he was 6’11” and 180 pounds soaking wet. “The Sports Institute is a place that kids are invited to if they think you have a chance to represent Australia in your chosen sport.” Justin’s team at school played every weekend traveling up and down the east coast of Australia, like a semi-professional team but without getting paid. Justin was at the Sports Institute for two years, continuing to develop to a level where he was chosen to represent Australia as a member of the under 20 Junior National Team. He played on the team three summers, and was also a member of the under 23 Australian Junior National Team where his team played in the World National Championship during one summer while Justin was on summer break from UConn. Although it seemed that Coach Calhoun was often rough on him, Justin has no regrets. People would ask him how he dealt with Coach Calhoun always yelling at him and Justin’s response was, “It’s a simple thing for me. It’s not that he was yelling at me because he’s mad, he wants to get the very best out of you. It was difficult for me because I was still learning the game. I have the type of mentality that never gives up. I’m very highly motivated.” Justin thinks Coach Calhoun is great, and although a lot of people are probably not aware, they had a good personal relationship. Justin has many good memories from his time at UConn. “Winning the National Championship was unbelievable. I was 18 years old. It was incredible. It’s my ultimate memory from UConn.” The game against Arizona that had the controversial goal tending call. Justin was in the game at the end to guard the inbound pass. “I remember being on the court hearing the sound of the buzzer, and everybody just stormed the court for the first time in school history. It was great.” Another fond memory is having won three Big East Championships while he was there including the championship game when Taliek Brown took, and made the shot from half court to win the game. Regarding last years National Championship Justin said he knew when they were in the locker room the year before during his senior year in San Antonio that the team was motivated to go back to San Antonio the next year, and win it. Justin has a girlfriend, Stephanie, who he met at UConn; the two have been dating for three years. Stephanie is almost finished with studying pharmacy there. Justin has a brother, Andrew, who is fifteen years older than Justin and who excelled at “little athletics” (long jump and discs). His parents reside in Australia. This season Justin is playing basketball in Berlin, Germany, and currently his team is the second best team in the German League. His team also plays in the European League called ULOEB-the United League of European Basketball where they play all over Europe.